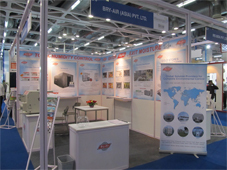 Bry-Air, the leading manufacturers of Dehumidifiers and Air & Gas purification, has participated in India Warehousing Show 2011. 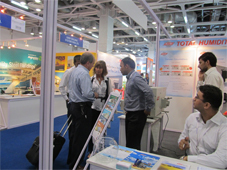 The exhibition was held at India Expo Centre, Greater Noida from 21st April to 23rd April 2011. 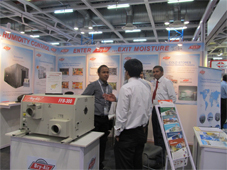 Bry-Air, the leaders in Moisture and Humidity Control, Air and Gas Purification participated in the recently concluded India Warehousing Show 2011 Exhibition, a first of it’s kind event in Warehousing industry. It has witnessed a strong participation from warehousing industry. More than 6000 visitors visited the event. The fair attracted 124 companies from India and Abroad. It gave an indication of the emerging importance that could be translated into reality. Hundreds of visitors shown interest in Bry-Air products and enquire about it. The conference was also held, focusing upon the operational process in the warehouse and logistic sector. The gathering was consisted of warehouse owners, warehouse management companies, consultants and industry end users. The conference aimed at discussing the latest trends and technologies available to minimize the operational cost and man hours that will help the industry in long run. Humidity control is a major challenge to fight in warehouses; it can cause organic (fungus, mold, mildew) or inorganic corrosion in storage goods. Whether its storage of costly Electronic goods, Engineering goods, Automobile components, Bulk food storage, processed food or fruits and vegetables if proper climate conditions are not maintained it can lead to organic and inorganic corrosion. Corrosion causes billions of dollars in loss every year for the whole industry. Warehousing industry has witnessed a sharp rise in recent years and now holds a crucial position in Indian economy. The growth potential of this sector is huge. Businesses utilize warehouses for various issues such as storage, value addition and other purposes. Indian warehousing sector is expected to grow at a rate of 35-40% every year. Bry-Air has showcased it’s Compact dehumidifier (FFB series), which is the smallest answer to all massive moisture problems. The Compact Dehumidifier removes moisture through a process of continuous “physical adsorption”. They are effective in terms of space occupied and energy billing. Similarly, Bry-Air’s Air and Gas purification systems are trusted by world leaders for storage of their costly electronics items in their warehouses like HCL, HP, Blue Star Ltd., IOCL, DELL & Airtel Etc. Environliner: Controlled mobile housing for safe storage. Bry-Air also provides the custom-made Environliners, an ideal solution to Humidity related storage problems. 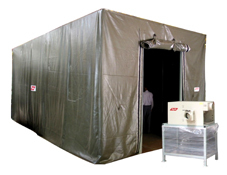 It is a humidity controlled mobile housing for safe storage of small equipment like engines, gear boxes, small arms, ammunition, optics, ration, documents, Enviroliners are customised modular PVC store house which can convert any space in whole or in part into cost effective humidity controlled storage area. Equipment and material stored in Environliner is protected against damaging effects of moisture-rust, mold, fungus etc. Enviroliners are custom made using flexible special grade thermo plastic barrier material to ‘build’ the walls on a framework and ‘zipped’ closed.